Just like Breath of the Wild before it, the worlds in Super Mario Odyssey do not stop at the level boundaries. 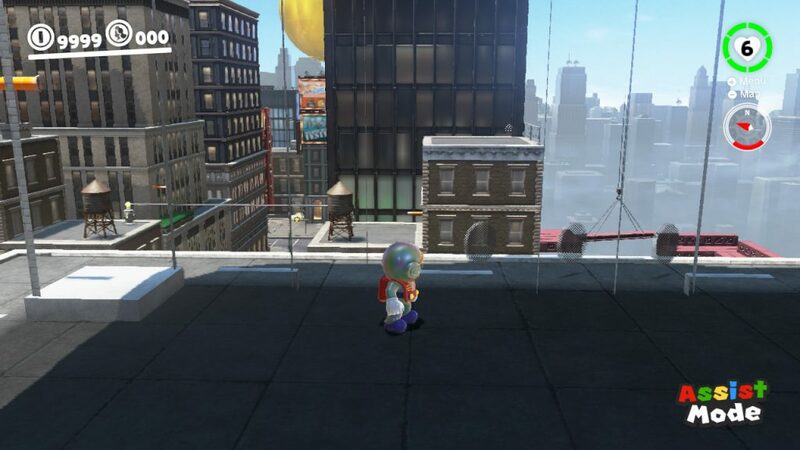 Indeed, whether it’s the distant metropolis of New Donk City or the giant dome of Steam Gardens, the backgrounds to the very levels sometimes seem even more intriguing than many of the places you actually visit. As a result, the game’s basically crying out for a Boundary Break episode about now. It’s one where a free camera hack and a bit of time seems like it could find hundreds of interesting details and secrets in the distance. Problem is, the Switch hasn’t been hacked yet. Or at least, it hasn’t been hacked enough for free camera codes to be made available for its games. This means that Shesez cannot make a video on it, and nor can any of the other people out there talking about off camera secrets like Slippy Slides either. Well, unless they realise that a free camera isn’t the only way to get this information. Nope, snapshot mode and out of bounds glitches can give you a pretty good look beyond the boundaries too! Which is why in this article, we’ll be doing just that. So, sit down, get the tea ready and keep reading to see just how Mario Odyssey’s kingdoms work beyond the view of the player! Starting with the first kingdom you encounter in the game, the Cap Kingdom. Yeah, we know. It’s technically not the first on the list, but hey that’s postgame content for you, and we’ll be delving into that one later in the article. Either way though, going of bounds here reveals some interesting little tricks the developers used to set up various mechanics in the level. For instance, you know that pond that appears near the shop? Do you ever wonder just where the water comes from there? The water just sits under the ground, and removing the stake raises the layer up so it covers the hole and creates the pond. It’s pretty much what you’d expect from a setup like this one, but it’s nice to have confirmation none the less. However, what’s less expected is how Nintendo coded the poison pit in the Paragoomba bonus room. You see, here the poison appears to go off screen, with the poison river passing through a gate and off into the distance. Based on this, you’d assume it’d just cut off shortly afterwards, perhaps with a V shaped endpoint like in so many other games. And you’d be right… initially. However, if you wait around out of bounds a bit (say, half a second), then even more poison materialises underneath you! Yep, for whatever reason Nintendo coded the poison river to spawn based on the player’s coordinates in the level and set it up so going further and further out of bounds would just make the river longer and longer to make up for it. It’s a very weird trick, especially when you consider that the river neither dynamically loads when you’re in the room nor is meant to be encountered past the walls of the area. Guess their poison spawning mechanics originally had a few more uses planned out! Still, enough with the Cap Kingdom for a moment since there’s really not much more to be seen there. In the Cascade Kingdom however, there is a rather… interesting discovery to be found outside the main playing field. You see, if you clip through the wall near the waterfall and make your way around, you eventually land on this invisible platform. It’s a round platform that’s basically about the size of the Odyssey, and it’s never encountered while playing normally. Or at least, that’s what we initially thought. In fact, it seems like the mystery platform is in fact the Odyssey. The version found when you first visit the kingdom. Cause ya see, on the first visit, the Odyssey is found broken down just after the bridge. It’s then reactivated, which removes it from that location and puts it back at the start of the kingdom like normal. 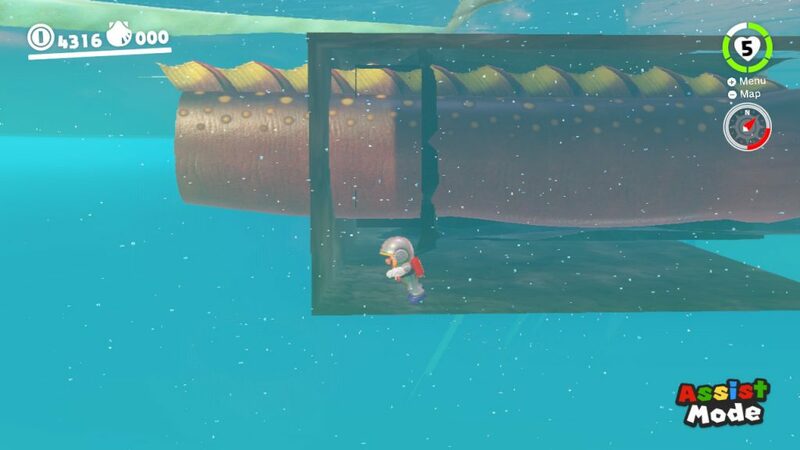 For whatever reason though, Nintendo seemingly couldn’t just remove the collision for the thing, so they just plonked the whole kaboosh outside the map and left it there for safekeeping. Interesting development tactic there. And that’s not the only weirdness caused by the kingdom’s different state. You see, as the speedrunning scene knows all too well, skipping ‘Our First Power Moon’ in Super Mario Odyssey is not particularly difficult. The walls on the other side of the river are easily bypassable and the pillar doesn’t really act as much of a barrier either. But getting there early actually has some very weird effects none the less. 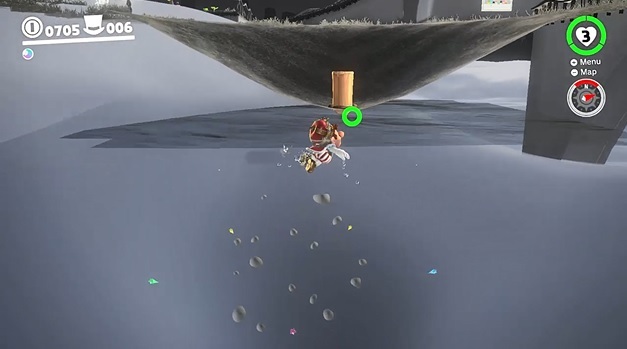 For instance, ground pounding where the pillar will fall will let Mario clip straight out of bounds for reasons unknown. Whereas various enemies and bosses either won’t spawn or won’t act correctly either. It’s rather unusual given how the kingdom works after that point. Moving onto the Sand Kingdom next. Is that anything interesting to notice there? Well, yeah. Like for example, you know how on the first visit, much of the level is frozen over? Yeah, thought so. 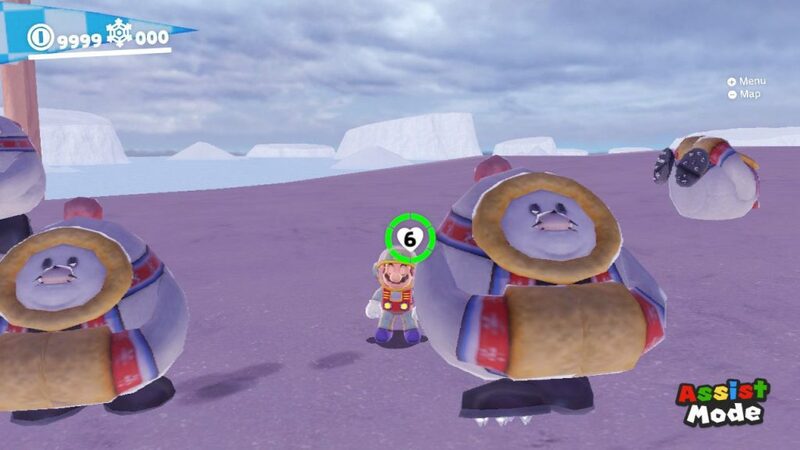 But have you ever wondered what it’d be like to ‘skip’ everything and collect the Purple Coins and Multi Moon locked in the ice? If so, bad news for you bub. They’re not real. And don’t think going underneath the floor will be a good way to skip things either. Nope, this kingdom is quite literally built on air, with every area not directly linked to a warp being above a void if you fall through the floor. This means getting anywhere out of bounds without Glydon or very careful cap bouncing is quite literally impossible. You can get out of bounds in the buildings, though don’t expect much there. As expected, the interiors aren’t modelled and the wall collision detection only goes one way (from outside in). Any curtains or light effects are merely 2D textures rendered behind the wall. Still, it’s not all bad there. Nah, Nintendo did actually add stuff to find outside the Bullet Bill Maze, and you don’t even need glitches or cheats to get there. Just wall jump up and well, you’ll find you can run freely on the roof and skip the entire thing. Heck, they even stuck a big stash of coins up there for those clever enough to find it! Though surprisingly not the one at the end of the Jaxi course. Ah, got to love random inconsistencies eh? Either way, enough sand for now though. Onto the Wooded Kingdom! Where there’s actually something quite interesting lurking out of bounds. You see, in the normal course of events, you never actually end up on top of the level. You end up near it since a Bowser emblem (and later a Coin Coffer) are present in the nearby field. But the actual tower you see from the rest of the level is mostly off limits. So, what’s up there anyway? And some of the area nearby does indeed have collision set up. This implies you were meant to be able to travel up there at some point, perhaps for an extra Power Moon or so. However, the main circular area up there… that doesn’t have collision and trying to land on it will send Mario falling into the boss arena. It’s strange really. Still, it’s a bit less strange than the explanation for how you get up there. You see, at another point in the level, there’s a Fire Bro inside a room you have to open by throwing Cappy onto scarecrow. That’s pretty normal, right? Yeah, except if you glitch in and manage to get the Bro out… he somehow turns invincible and refuses to ever die. Regardless of how much Mario jumps on him, attacks him, etc. This then lets you jump on him endlessly and soar up to the top of the level like an out of control rocket. It’s even weirder in game than in this explanation. Slightly less weird is that the boss of the level (Torkdrift) isn’t actually loaded in the Secret Flower Garden until you’ve beaten the missions before him. Indeed, if you go early (and try and skip everywhere else), he simply doesn’t appear in his arena at all. Quite smart on Nintendo’s part, given the chances of someone skipping everything else (without glitches) are few and far between. It’s also probably worth pointing out now a little secret you may not know about those rocks too. 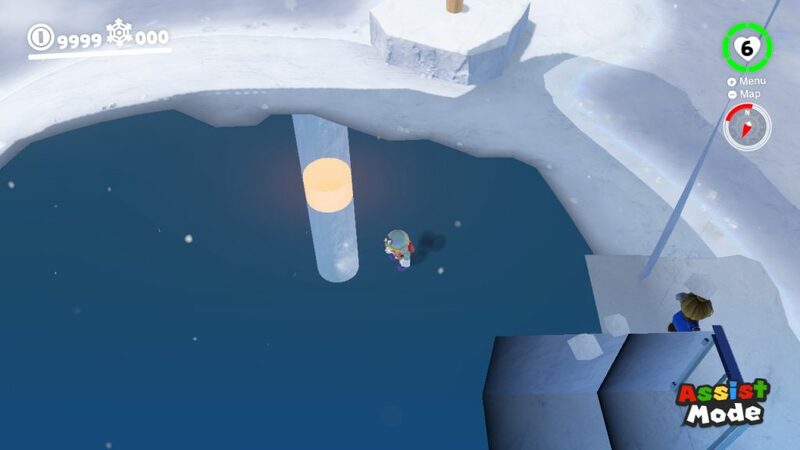 Turns out the ones you’re meant to kick around for a Moon really can be picked up if you position them right (read, in water), and in some areas cause Mario to slide around in the floor when held. Unused behaviour? Hard to say really. Moving on now, the Lake Kingdom actually has quite a few secrets you may not know regarding content outside the game world. For example, you know that dome around the underwater town? Well for whatever reason, it actually carries on around the back half of the area too. This is despite the back half of the dome being completely invisible. And the weirdness doesn’t end there. No, the deep pool with Captain Toad has a few interesting secrets too. 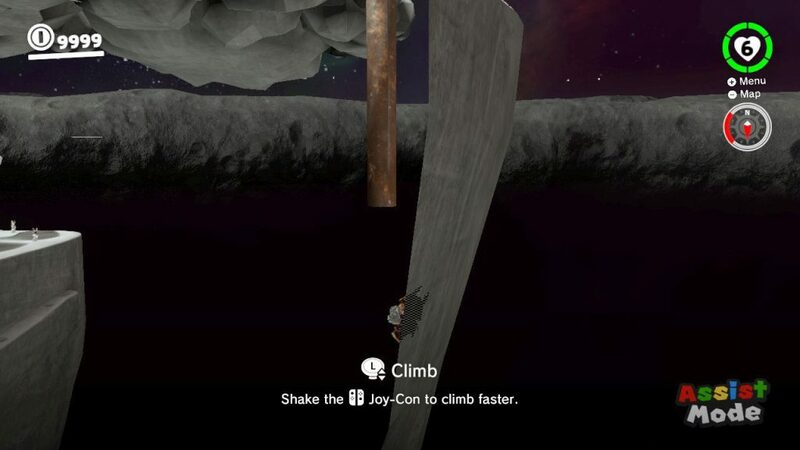 Not only does it exist on the same map as the main kingdom, but it seemingly passes beneath the level’s death barrier, meaning that any attempt to follow it down from outside will kill Mario. Said death barrier also has some other weird effects here too. Namely, it goes around the outside of the level and automatically kills Mario if he swims too far out. That seems normal at first, except this is the only kingdom in the game where this happens at all. Every other kingdom you can travel outside the map in either has the barrier end before the level boundary (Mushroom Kingdom, Darker Side) or has no death barrier at all (like the Seaside Kingdom). Yet for whatever reason, the Lake Kingdom DOES have one around the border of the map, despite the player never being able to travel there and every other area not featuring the same physics. Did Nintendo realise this kingdom was too easy to break out? Did they originally intend you to go there? Was this a setup they only got around to adding in one level? There’s also a box you can’t see out there too, though that appears to be the setup for the ‘maze’ like area you swim through to access the second section of the level. But yeah, that’s it for now. What’s in store in the next kingdom? Eh, not much to be honest with you. 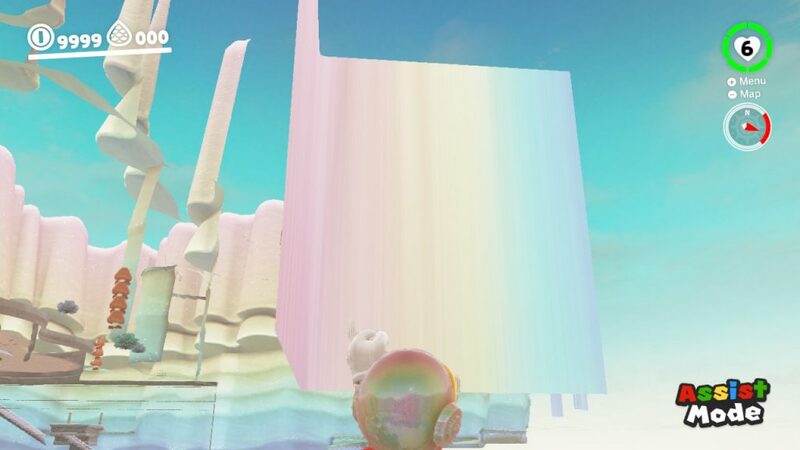 It’s literally meant to be just a boss arena, and the background is pretty much just clouds. 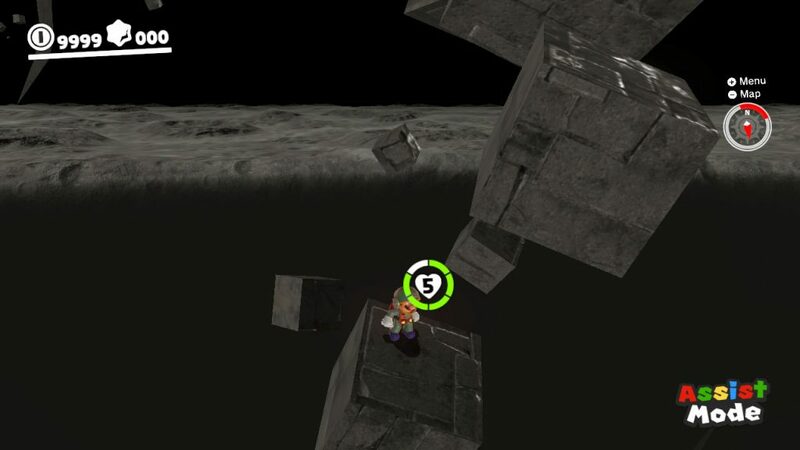 Still, you can push Bowser off the arena here, and he does seem to jump back to the level like in Super Mario 64. That’s something, right? As for the next kingdom on our list, it too doesn’t have much of interest on a visual level. 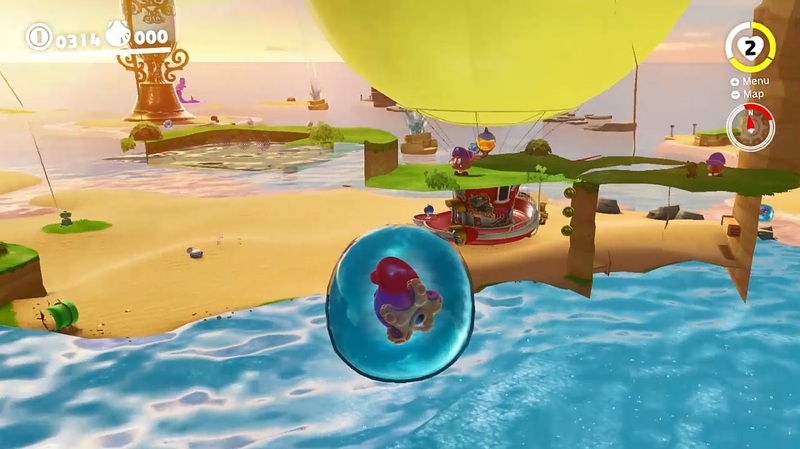 However, it does have a neat ‘discovery’ if you clip out of bounds near the Luigi’s Balloon World starting point when Cappy is in danger. You see, if you do, you can enter the 8-bit section behind a nearby door before you’re meant to get there. But the game doesn’t actually have 8-bit music for that part of the game. So, the results are that the music’s replaced by nothing by silence while you’re in 8-bit mode. It can be pretty spooky to be honest, the ambience making the situation even more unsettling than it already is. Other than that, though, as said, there’s not much to see here. Even the visual style of the Lost Kingdom doesn’t really lend itself to background detail. Which is a far cry from this place, perhaps one of the visually busiest levels in the entire game. As a result, it was almost certain to have a few things to notice here. 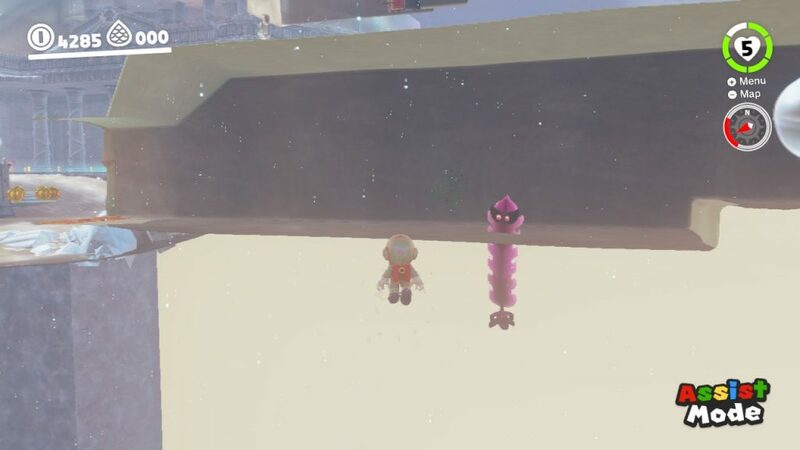 Like for example, this invisible platform in the festival level. 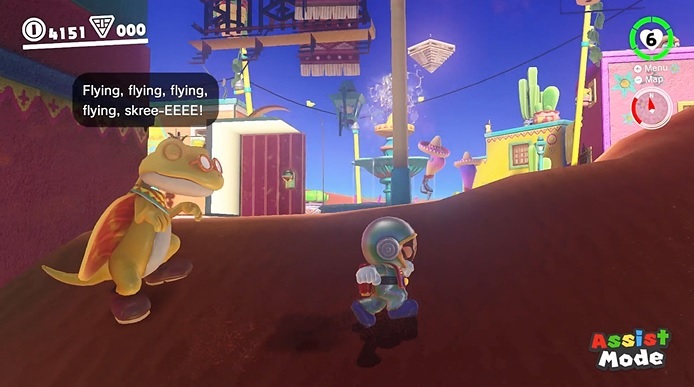 It’s presumably meant to be one of the extra platforms near the start of the area in normal gameplay, but thanks to the limited setup of the mission, Nintendo removed its visuals while leaving in the collision detection. And the interesting out of bounds elements don’t end there. For instance, you can clip into a certain building with a well-timed roll cancel glitch. 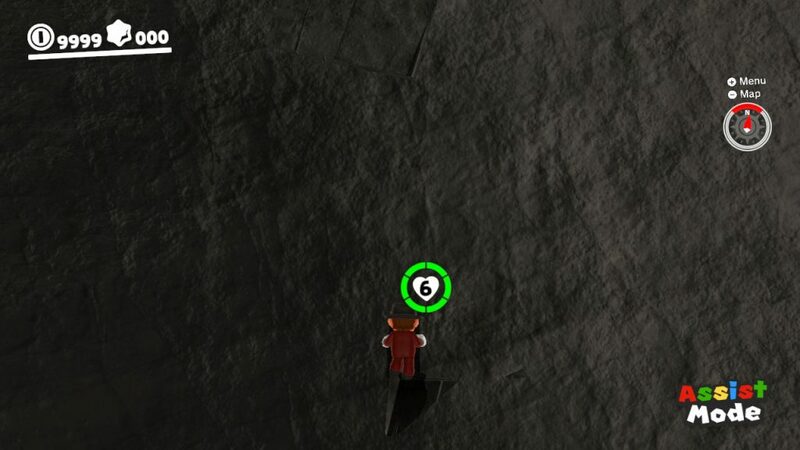 However, if you do, you’ll notice a hole in the floor Mario falls down to reach the area below. Pretty strange for an area you never visit to have that, isn’t it? Yeah, I thought so too. Why is Nintendo adding specialised collision detection for an empty and untextured building interior? Eh, maybe they originally intended to make it visitable, with an actual Power Moon hidden in here. Another mystery here are the ‘ghost people’ of New Donk City. You see, for whatever weird reason, there are New Donkers you can never talk to or interact with in the level. These guys appear from a distance, then vanish the second you get close enough. It’s especially noticeable with the celebrating guy on the corner of the first street you come across, who fades out of existence before your very eyes. So, what is he anyway? A ghost? Or just a background prop meant to make the city livelier than it actually is? Eh, guess we’ll never know! This area in the T-Rex chase scene having collision, even if it doesn’t actually match up with the graphics used. As well as the answer to what’s going on with the building windows. Spoiler: like in the Sand Kingdom, it’s all just a flatly textured illusion. Either way, that’s enough for the Metro Kingdom now. Onto the snowy wastes of the Snow Kingdom… or Shiveria as they call it in the brochure. Where I may as well answer the obvious question, namely how the tunnel connects to the town. The answer? Like everywhere else in the game, it’s just a warp after a short drop. Sorry everyone, no quick loading between two areas on the same map here. That said, don’t write off the kingdom as boring just yet. Because as has been well documented online, it’s extremely easy to visit the racetracks by foot thanks to a handy bug that lets you get out of bounds in the room with the Shiverian racer you capture. And that… is where most of the interesting background details in this level are. For one thing, the tracks have nearly full collision detection, with the areas used by spectators being explorable by Mario. 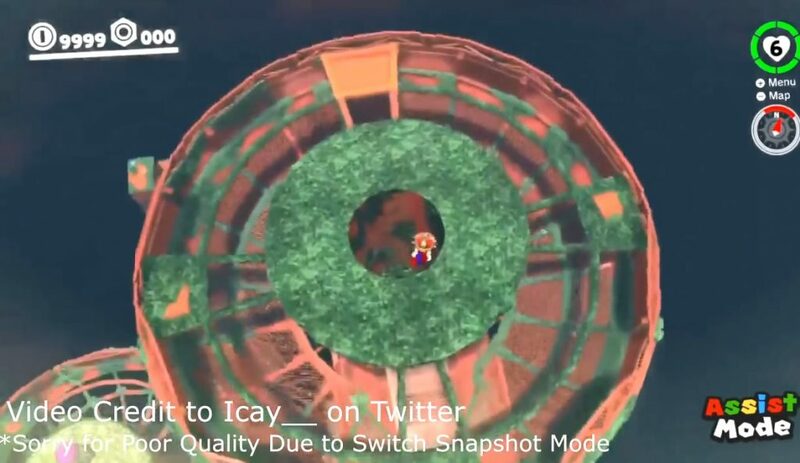 That’s strange, given how the player would never usually land here at all (even in the race, Cappy sends you back if you fall off the track too far). Why are these coins available in the secret racetrack? Honestly, it seems like the answer is ‘because Nintendo wanted you to explore on foot at one point, before deciding against it later in development’. And there’s no better evidence for the ‘decided against it late in development’ angle than the bizarre death barrier setups in these areas. Why? Because they’re seemingly placed at random. Like on the middle of the track. Or in the case of the secret track, all around the area about three metres above ground level (meaning you can only get down by climbing up and vaunting the invisible death floor). It’s a very strange setup and seems like one that would only make sense as a last minute ‘fix’ (that didn’t quite work out in practice). Where very easy out of bounds clips have led us to a few rather intriguing discoveries about the area. For example, have you ever wondered how those Maw-Rays work? You know, those scary Unagi esque eels that attack from holes in the wall? Well the answer is simply that they appear shortly before they emerge and then disappear once they retract back in afterwards. There’s also no full ‘body’ for these creatures either, it just cuts off about three feet from the hole in the wall. And this is all true of the Komboos (seaweed creatures) too. They appear halfway into the floor about a second before emerging, then rise up afterwards. Similarly, the tunnels, water spouts and other objects here all cut off rather near the ‘floor’ too. Not surprising, but a tad disappointing if you wanted to look beyond the camera boundaries none the less. Never the less, the kingdom does have a few intriguing extras hidden out there. Like this polygon that seems to go straight into the floor and off screen. What exactly is it? Why does it continue forever? Or how about the fact the world is bordered by invisible walls and floor on all sides, even out of bounds? You don’t die or fall forever, you just stop. Like with the Lake Kingdom’s weird death border, this behaviour is also not used outside of this one kingdom. But the most interesting one happens if you go through a painting with the right conditions met. The second shop icon on the map sticks around in the new kingdom. This leaves you with an unreachable shop icon way outside of the Cascade/Wooded/Sand Kingdom. Unfortunately, said icon doesn’t actually correspond to a shop in the new kingdom (at least from what people have tested), but it does raise the question of whether the kingdoms are connected in some way or what not none the less. As for the Luncheon Kingdom? Well, that’s got few background details, but some neat sequence related ones instead. For instance, you can actually get to the surface in older versions, at which point the kingdom is a ghost town without many of the Power Moons or the Odyssey. This proves that when you go through a painting (at least in a kingdom you haven’t unlocked normally yet), the game doesn’t count as you having been there yet, and basically puts the place in a shutdown state. And like the New Donk City hall before it, the volcano here is on the same map too, as certain people have found out via a cooking pot glitch. Things sure do get funky when the game tries to load two maps at once, don’t they? There’s really not much to say about this one, at least not until the camera has been hacked. The place is so small in terms of explorable area and so lacking in glitches and what not that you can’t really find anything unusual here. I guess it’s impressive that most of the Ruined Dragon has collision even after his boss battle though, assuming that counts. And the same lack of things to find is true for Bowser’s Kingdom too. 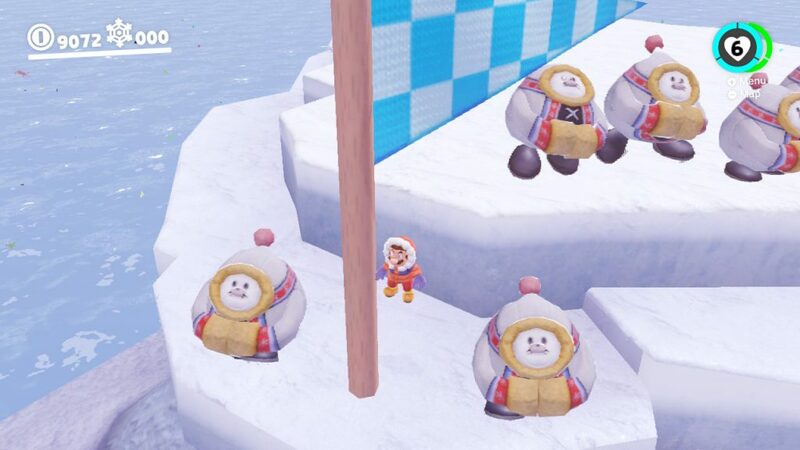 Not because it’s too small, but because every area you can explore has full collision for everything you can possibly interact with, from the waving flags to the banners and Bowser head statue. No, it’s never used, and yes, it really is about two pixels in size. In fact, it’s so ridiculously small than the game physically cannot place Mario back on it properly if he falls off, leading to an endless death cycle in Assist Mode (at least till the plumber’s health runs out). And that’s not the only odd area with collision that makes no sense. No, the rocks underneath the church also have collision detection too. Again, they’re never seen by the player, never used by the player and have no reason to be there at all, yet they’re fully modelled and act like platforms. Seems like someone at Nintendo had plans for them at one point in time! Onto the bonus/postgame kingdoms now though. And where the Mushroom Kingdom is concerned, there’s really not too much to see here. Huh, guess these things have some neat uses after all! Then magically watch Mario grab onto an invisible pole and climb into a supposedly solid wall. It’s a very simple bug which also proves that the collision for certain objects goes well beyond their graphics. Seriously, Mario’s not even holding the pole in this picture! As is the setup for the Darker Side in general. You see, the start and end of the level are clearly connected, and the music in each is different. It’s like walking out of the liveliest party ever into a tragic movie scene. Jarring, yet amusing in its own way. And that jarringness kind of summarises Super Mario Odyssey when you do these glitches. You’ve got the places where Nintendo put tons more effort than needed into areas the player would never reach, and then they’re right next to others where the background and effects just cut off where you’d imagine they would. It’s like each kingdom was built in its own way, created in a silo separated from the rest of the game and slotted into the adventure later in development. But you know what? That’s a good thing here. It’s the games which you don’t know what to expect which are the most enjoyable, and Super Mario Odyssey is a shining example of it all the same. So yeah, that’s it for now. What did you think of it all? Did you learn anything interesting about what happens outside the worlds of Super Mario Odyssey? Do you feel this game could even more interesting to look at when people like Shesez get free camera control for the title? Post your thoughts on this in the comments below, or on the Gaming Latest forums today!